On the guitar, there are many types of chords that include 2nds and 9ths, but the three that you’re most likely to encounter are sus2, add9, and 9 chords. You start with the sus2 chord, a chord that has its 3rd replaced or suspended by a 2nd. Sus2 chords are stacked 1-2-5 or some combination thereof. 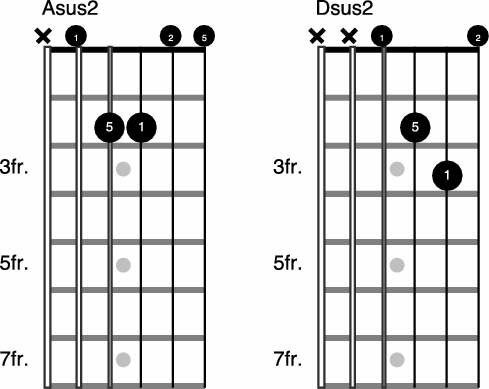 The two most common sus2 chord shapes are based on A and D in the open position, with numbers representing intervals. Notice that neither chord has a 3rd. For this reason, the chords are called sus and the 2nds are still called 2nds even though they extend more than an octave away from the chord roots. You can move these shapes up and play them as full or partial barre chords to produce sus2 chords for other notes. Technically, an add9 is a 2nd that’s extended in the next register and added to a chord that still retains its 3rd. It’s supposed to be stacked 1-3-5-9, with the 9th above the 3rd, but you occasionally see it stacked differently on guitar. You may also hear and see this chord identified as an add2. Here are common add9 examples. 2nds and 9ths are more likely to be added to major chords, but you occasionally see them in minor chords, too. When a minor 3rd is replaced with a 2nd, the chord is still called a sus2. After all, its formula is still 1-2-5. For example, Am, 1-f3-5, becomes Asus2, 1-2-5. If you add a 2nd or 9th but retain the minor 3rd, the chord is called minor add9 and is usually written as m(add9). Chords written as m(add9) are some combination of 1-f3-5-9. Here are a few examples. Sus2 and add9 chords naturally occur on all but chords iii and vii in the major scale. In addition to add9 and m(add9) chords, you see chords like G9, C9, and D9 in music. When a chord name includes a 9 that isn’t preceded by add, m, or anything else, then the implied chord is a dominant 9th, which is a dominant 7th chord with a 9th. The formula for 9th chords is 1-3-5-f7-9. It naturally occurs on chord V in the major scale and is the only type of chord with both a 7th and 9th that regularly occurs in popular music. 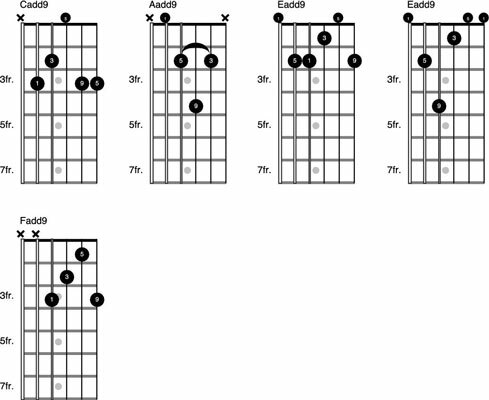 Just as dominant 7th chords are represented by only a 7, dominant 9th chords are marked only with a 9. Guitar players frequently use 9th chords, especially in blues music. Here are a few of the most common shapes. With the G9 shapes, the root notes used for tracking are on the 6th string (shown in the white dots) and not usually played. As you play complex chords, it’s not always possible or practical to include all chord tones. As a result, you often leave some chord members out as seen with the G9/B and G9/F, both of which omit the root. Note: Extended dominant chords are dominant 7th chords with extensions added. They include the 7th and all extensions leading up to the number in the chord name. So D11 is 1-3-5-f7-9-11 and D13 is 1-3-5-f7-9-11-13. Because guitar players can’t stack chords like this, if these chords occur at all, they’re played as fragments with some chord members left out.